A group of local people are running this simple yet successful environmental campaign in Beeston. The Greening Campaign was launched in Beeston Rylands in October 2010 and was then launched in part of central Beeston. 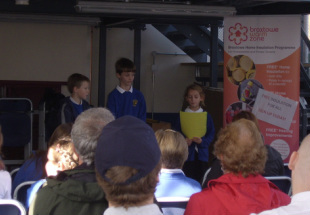 After that we won a grant of £5,000 for a renewable energy project. Our aim is to help residents of Beeston reduce the amount of energy and water that they use, in order to save emissions of carbon dioxide into the atmosphere. At the same time as helping the environment, residents of Beeston Rylandsand central Beeston have also saved themselves some money on their gas and electricity bills. For more details, see below. Even simple changes, such as turning off inactive appliances and standbys, can make a difference. Of course, the more people make the changes, the more difference it makes. Now we have started to bring the same advantages to the rest of Beeston - see under News below or go to Events. The Greening Beeston campaign was also launched at John Clifford School on Saturday 13th October 2012, followed by distribution of cards to help people make the changes. Altogether Beeston residents were then saving roughly 75,000kg of Carbon Dioxide and 115,000 litres of water per year. More recently we have also been focusing on avoiding waste, which is another cause of carbon emissions: Reduce, Re-use, Recycle should be preceded by Refuse and followed by Rot (composing what we can), not forgetting Repair. The group is supported by Broxtowe Borough Council. Recent Greening Beeston documents can be seen here. - and other related events. In order to reduce emissions of CO2, we aim to cut our food miles. So we try whenever possible to use food that is in season and has been grown locally. To find our Spring Recipes, click here. All the seasons are available at: Spring, Summer, Autumn and Winter (some still under contruction). Say NO to bottled water - find out more here. From last September's Heritage Weekend the cheap seasonal recipes inspired by austerity during and after the war are available here. Also, we now have some economical Household Tips available here. Cottage Garden Seed Mix​: for instructions click here. Travel﻿Right: www.travelrig﻿﻿ht.org.uk/broxtowe helps you find out how to save CO2 emissions by walking, cycling or using public transport in Broxtowe. Everybody's Talking About Climate Change: ﻿﻿www.everybodys-talking.org ﻿﻿has lots of information about climate change, community news and a free question service. Say NO to bottled water: find out more ﻿here﻿. Learn about composting from the Council's videos. In case you missed them, the recipes for cheap, seasonal food inspired by rationing and post-war austerity are available here. Residents of Beeston are learning how to make simple changes which can help households reduce energy consumption and therefore save money, as well as protecting the environment. At the start some Beeston Rylands residents were able to make 5 simple changes and tell others about them by displaying the 'Leaf’ card in their windows. After the cards were counted, Rylands’ residents were found to be making savings of about 46,000kg of CO2, 67,000 litres of water and more than £8,000 per year. 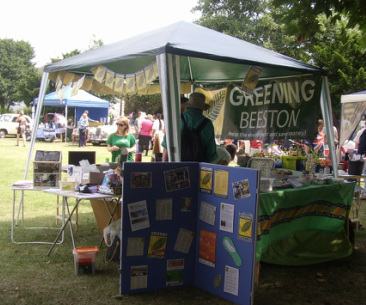 Throughout the year, the Greening Group has attended local events such as Beeston Carnival, sharing tips about environmentally-friendly behaviour. Our “Eco Dolls House”, illustrating simple ways to make changes to our homes and lifestyles, has attracted interest from young and old alike. Find out more and how to get involved, phone Janet on 0115 925 6368 or send a message under Contact Us. Greening Beeston has booked a visit to the Veolia Recycing Facility (where the contents of green bins in our area go). Click here for more information. We will have a stall on ​Saturday 2nd March 9.30 - 12.00 at Beeston Methodist Church, Wollaton Rd, NG9 2NG. PLEASE NOTE: There’s a possibility of the building changing hands by 2nd March so please check if coming a long way (either HERE or phone Mary Venning 0115 854 2994). See here for more details. We look forward to seeing you there. Greening Beeston's green Christmas tree was on display at the Festival of Christmas Trees at the Parish Church 14th - 17th December. We made it ourselves as we did in 2012, 2014 and 2016. Click here for more details. For Cottage Garden Seed Mix instructions click here. We will have a stall at the Heritage Open Day at Bartons, Chilwell, on Saturday 8th September 10.00 – 3.30. Our theme this year is: Avoid single-use plastic! See here for more details. We will have a stall at the Remarkable Recycling Gala, which will be held on Saturday 9th June 2018, 10 am - 5 pm at Middle Street Resource Centre. Visit here for more information. We hope to see you there. We will have a stall at the Beeston Community Growers 9th Annual Plant Swap, which will be held on Saturday 26th May 9.30 - 12.00, Wollaton Road Methodist Church. See here for more details. We look forward to seeing you there. ​This year Greening Beeston's Seed Swap will be held on Saturday 10th March from 9.30 to 12.00 at Wollaton Road Methodist Church, NG9 2NG. See here for more details. We will have a stall at the Heritage Open Day, which will be on Saturday 9th September at Middle Street Resource Centre, Beeston NG9 2AR. Our theme this year is "What Grandma knew" with useful tips from the past about cleaning without synthetic ​chemicals and other money saving ideas. Please come along and tell us about any ideas you have from the past, or new ones you've just thought of. See here for more details. Our stall will be at Beeston Carnival on Saturday 8 July 10.30 - 4.00 with our eco dolls' house. This year our themes are RECYCLING and USING UP LEFTOVER FOOD. More details here. FREE EVENT: Film “Grow your Own” (PG) - a poignant, warm and witty film about a group of allotmenteers. See here for more details. Greening Beeston is taking part in the May Day Multicultural Spring Celebration at Middle Street Resource Centre on Saturday 6 May 12.30 - 5pm. See here for more details. We will be holding our AGM on Tuesday 25 April 2017, 7 - 7.45 pm followed by our usual meeting at the White Lion Pub, Station Road, Beeston, NG9 1FX. Our Plant and Seed Swap will take place on Saturday 25th March. For more details click here. Please note the postcode for the church is NG9 2NG. Slightly late for Shrove Tuesday but why not try these ideas for pancakes using up leftover food? Greening Beeston's green Christmas tree was on display at the Festival of Christmas Trees at the Parish Church. We made it ourselves as we did in 2012. Click here for more details. "What's Left in the Larder?" - useful tips from the past for using leftovers and reducing food waste. Click here for more information. We were sorry to cancel our stall because of the heavy rain but we are planning a stall at the Heritage Weekend. We have a display about Recycling at the Beeston Library for 2 weeks. We won't be there in person most of the time but, if you have any questions or ideas, please visit us at the Carnival. More details here. We'll be at Beeston Carnival on Saturday 9 July with our eco dolls' house. This year our theme is RECYCLING and USING UP LEFTOVER FOOD. More details here. The Beeston Growers will be holding a Plant Swap on Saturday 7 May at Wollaton Road Methodist Church and Greening Beeston will have a stall. More details later. After initial problems with date and time 13 people from Beeston and surrounds attended the very interesting and enjoyable visit organised by Greening Beeston. Lesley Taylor, the Education Officer welcomed us with refreshments and an initial talk including a team challenge to sort a bag of (clean) household rubbish. One team made 1 mistake and the other made 2, including the plastic inner bag from a cereal packet. Apparently most adults typically make 13 mistakes and children 10, so we did better than most. We then kitted up with hi-viz vests, head phones and hard hats before entering the actual sorting facility. The facility is in an enormous hangar-like building housing huge conveyor belts and various types of sophisticated machinery using lasers, electro-magnets, giant tumblers and air currents. Some of them sort plastics, some sort steel, aluminium, paper and cardboard. The different categories of waste are baled up and transported to different destinations where they are transformed into an astonishing range of new products such as fleeces, garden furniture and bicycle frames. The building, though noisy and slightly dusty was surprisingly not bad smelling. From the viewing platform we had excellent views of all that was going on. We were particularly impressed by the small number of human sorters who were housed in clean cabins insulated from noise and dust. They could talk and listen to the radio. Staff welfare is a priority with health and safety provision and a canteen. Any employees requiring educational assistance are offered in-house training courses. We could see that the sorters were having to remove things the machines missed such as huge quantities of plastic carrier bags which should not have been placed in the green-lidded bins but are classified as general waste. After the tour we had a chance to have our questions answered back in the visitors centre. Apparently the general waste which cannot be recycled is taken to an ERF (Energy Recovery Facility) in Sheffield. Here it is incinerated at extremely high temperatures and the gases are filtered for all contaminants so that only steam is released into the atmosphere. The heat generated is used for district heating to heat hospitals and other public buildings. We learnt that high grade plastic such as plastic bottles can be sold for making new products but low-grade plastics such as bubble wrap and fruit punnets cannot. If too high a percentage of the wrong items (contaminants) are found in the bales the whole truckload can be rejected. This could be things such as dirty pizza boxes, glass and wood. One of the worst things that regularly turn up is used nappies! Selling the sorted recyclables is what makes it possible for Veolia to help Nottinghamshire recycle and work towards increasing the County’s recycling rate. Don’t put in dirty or wet paper or card or any soft plastics or plastic bottle tops, and definitely no carrier bags or nappies. Shredded paper clogs the machines so should go in general waste or compost. Do use other ways of recycling things that cannot go in the green-topped bin. For instance glass, tetra paks (eg juice cartons) and batteries can be recycled at Sainsbury’s. And stop worrying about what gets classified as general waste, as very little goes to landfill. However the more we can give to charity or put in compost the less general waste needs to be transported and disposed of in other ways. Greening Beeston will be happy to answer any queries and we will be making a display for the Beeston Carnival on Saturday 9th July. You can also contact Lesley Taylor directly Lesley.taylor@veolia.com or 0203 567 4391 or via the website: www.veolia.co.uk/nottinghamshire. She will also be happy to arrange visits for small groups (up to 20) Monday – Friday including evenings. Greening Beeston is having a Seed Swap on Saturday 19th March 2016, 9.30 – 12 Noon at Wollaton Road Methodist Church Wollaton Road Methodist Church. Click here for more details. Our AGM will be held on Wednesday 2nd September at 7.00 and will be followed by a normal meeting to plan our next event. Details available here. We will be at the Pearson Centre on Saturday 12 September 10 - 4. See here for more details of what we'll be doing. Again to save additional consumption we took the decision not to buy special 'official' T-shirts to wear. Instead we have a policy of each wearing something green that we already own, together with our home made 'leaf' badges. 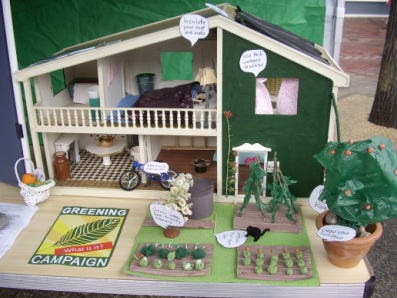 As usual our 'green' dolls' house generated considerable interest, especailly with young visitors. Also our food sold well, including local Beeston honey and preserves made by volunteers. Were the bees aware they were volunteering too? We now have free Greening Beeston stickers to put on water bottles, to show that we are re-using the bottles by filling them with tap water. That way we can save money and reduce the energy costs of the water - tap water has a much smaller energy cost than bottled water. Read more about it here. Two members of Greening Beeston are opening their home to the public on Sunday 10th May and will be happy to answer questions about it. The tours are free at 2.30, 3.30 and 5.30. Booking is essential: http://bit.ly/1FNULrm. Find out more by clicking here, or for other houses open in May visit www.everybodys-talking.org/ecohomes. If you can't visit this home, some information is available on the house's website: http://elm-ave-beeston.weebly.com/. This year during April and May a number of homes in the Nottingham area are taking part in a Green Open Homes event. Find out more at www.nottingham.greenopenhomes.net and look under Transition West Bridgford Open Homes. Most of the homes are in West Bridgford but on 25th April two homes in Beeston are open. To visit you need to book in advance via www.wbecohouses.co.uk. Every home includes a link to Eventbrite, where you can book your free visit. On Friday 27th February 2015 Greening Beeston in partnership with Nottingham Energy Partnership and Broxtowe Borough Council, held a free event to help local residents to save money on their energy bills. Miranda Cumberbatch and Alison Mcguire, from NEP, shared some facts about energy costs and good reasons for switching suppliers. Then everyone present was invited to have a one-to-one session using the impartial switching tool on the Climate Nottinghamshire website to find how much they could save on their gas and electricity bills. The process takes about 5-10 minutes and the average saving can easily be around £200. Feedback from the event included comments like 'you have given me the impetus to actually log on and look for better deals - I am IT savvy but I just needed more confidence' and ‘nothing complicated about it’. As well as free drinks, biscuits and homemade cake, Greening Beeston provided energy-saving tips for the home and kitchen, and gave away free shower savers and room thermometers. Beeston Growers are holding a Seed Swap - Sat 7 March 9.30am-12pm, Wollaton Road Methodist Church (Greening Beeston will have a display and leaflets). The group is now planning another "Eco Christmas Tree" to be displayed at the Parish Church's Christmas Tree Festival, which takes place from 18th to 22nd December (and the trees will stay until 29th December). The challenge is to 'make' a tree, rather than buying one, and make our own decorations with recycled materials. It will cost nothing, except a bit of time. Most trees cause carbon emissions both from transporting the tree and from the lights, as well as disposing of them. The only emissions from our tree will be from the electricity for the lights, which are LED lights and use only 0.8 watts. See here for how we made the previous one in 2012. We will have a stall at this event at Barton’s Garage. Come and find out what we do. Click here to find out more. 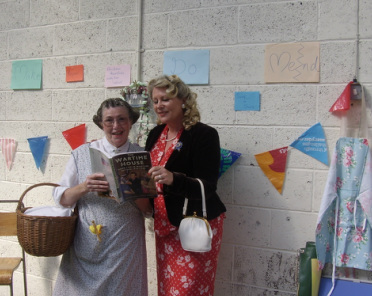 Greening Beeston took part in the Heritage Open Day activities at Barton’s Garage on Saturday 13th September, sharing wartime and 21st century tips on saving money, recycling and using cheap, seasonal food. It is fascinating how many of the current tips helping people to reduce their energy bills, cut their carbon footprint and save money are the very same ones that were taught during rationing and post-war austerity. Visitors were encouraged to have a go at making a Rag Rug and several shared memories of their grandmothers making these and how soft such rugs were to lie on. Samples of nettle cake, potato pastry tarts and Anzac biscuits all sold out and for those who missed out, or want to make them again, the recipes are available here. Also on display were toys made from plastic milk cartons and baby milk tins, a dress made from a curtain, Christmas decorations made from everyday household items and “rubbish” – dried orange slices, foil beads and polystyrene chips – and bunting made form plastic bags. Visitors were encouraged to share their own tips and memories and these included adding the last dregs or solidified jam to stewed fruit to sweeten, leaving conkers (horse chestnuts) in a corner of a room to fend off spiders, using old coffee grounds around plants to deter slugs and snails (ask your local coffee shops for free grounds) and using pine cones as fire-lighters. Memories included wearing “pass-me-downs”, the thrill of sweets coming off ration and the horror of dried eggs! Greening Beeston had a busy day at Beeston Carnival on Saturday 12th July, with various activities and tips on the 3 R's – ﻿﻿Reduce, Reuse, Recycle﻿﻿ – encouraging people to buy and use less, reuse what we can, as well as recycling more of what we do buy. Volunteers gave away washable labels to stick on recycled plastic bottles to spread the message about using tap water rather than buying expensive and environmentally-unfriendly bottled water. Visitors were also invited to make a pledge to “change one thing” and the ideas included “donate all I can to charity shops, even lids of broken casseroles”, “thaw food in advance rather than defrosting in the microwave”, “organise myself to use the recyclable batteries that I already have”, “always use a lid when boiling stuff”, “keep a reusable shopping bag in my handbag”, “make the effort to take Tetrapak (juice and milk cartons) to the recycling bins in Sainsbury’s car park”, “only buy the fruit and veg that I need”. The Spanakopita (Greek spinach and feta pies) sold like hot cakes but were beaten to the finishing post by the Honey and Nettle Cakes (for recipes, see here). Greening Beeston will have a stall at Barton’s Garage as part of the ﻿Heritage Weekend on Saturday 13th September﻿ sharing wartime activities, recipes and tips to encourage us to “Make Do and Mend” - see here. Greening Beeston is supporting the seed swap organised by ABC LETS (Attenborough Beeston & Chilwell Local Exchange Trading System) at Wollaton Road Methodist Church, Beeston. See here for more details. If you are interested in finding out about energy efficient homes, now is your chance to find out what it's really like from local people. This year two Beeston homes are taking part in the Nottinghamshire and Derbyshire Eco Open Homes event, which runs from 10th to 18th May. See here for more details. We are planning Workshops to illustrate practical ways to save money on every day expenses, which are based on the Live4Less course (http://www.mea.org.uk/live4less). Our aim is to help local people save money on food, clothing, travel and energy. More information will be available soon. The Greening Beeston AGM was held on Tuesday 1st October at 7.30 in Beeston Baptist Church, Dovecote Lane, NG9 1HR. The minutes are available here. Greening Beeston gave away an assortment of fans to a few lucky stallholders and visitors to Beeston Carnival on 13 July as a cheap and easy way of keeping cool. 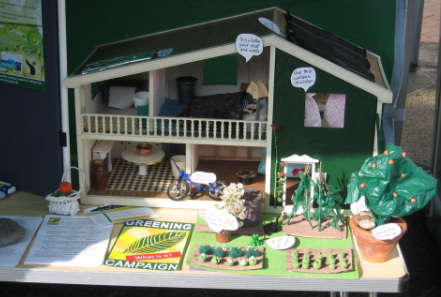 There was a steady stream of visitors to Greening stall, attracted by the virtual beehive and the opportunity to get advice about bees, the eco dolls house, the assortment of plants and the tasty snacks. The hot weather has seen a big rise in the number of bumblebees and concerned residents sought reassurance that no action is required if they find a bees' nest in their garden. Almost all the plants on offer found a good home and free Love Your Leftovers recipe books were also snatched up. The eco dolls house is still an ongoing project and has now had an internal facelift with eco-friendly paint from Highclere Interiors who have recently opened in Beeston. This week’s recipe is another low-cost way of keeping cool: STRAWBERRY AND REDCURRANT CORDIAL - to see it and other recipes click here. Posters with a green message made by Beeston children were on display on Tesco's community noticeboard in Beeston. Now you can see them here. Greening Beeston was successfully launched on Saturday 13th October at John Clifford School, with over 70 people in attendance. Simon Thompson, head of John Clifford School welcomed everyone to the event, held in the school’s community room. Then Julie Jackson, chair of the group, explained about the Greening Campaign and how volunteers were preparing to distribute the Greening Beeston ‘leaf’ cards to many households in Beeston. The cards have a list of simple changes that people can make in their everyday lives, which will help the environment by reducing CO2 emissions, as well as saving money, for example boiling only the amount of water you need. Residents are asked to display the leaf on the back of the card in their window, once they had made at least 5 of the changes. One change in the list is to walk or cycle instead of using a car, which the children at John Clifford had already started last term. Their “walk to school” days were described by Year 6 pupil Beth Allford, who enjoys her 15 minute walk to school. Performances by some of the other children from the school illustrated other changes residents were being asked to make, including turning off the tap while brushing your teeth. There were tours of the school’s garden by the Gardening Club, which helps the children learn how to grow fruit and vegetables. Growing your own food is educational and fun, while saving the CO2 emissions caused by transporting food from elsewhere and avoiding wasteful packaging. A steady stream of visitors continued through the afternoon to visit the stalls and exhibits related to saving carbon emissions, as well as sampling the home made cakes and refreshments, and taking part in the prize draw. The prize was an energy monitor, which measures exactly how much electricity a household is using and helps people find out how to reduce their use. The Greening Beeston exhibition in Beeston Library though the rest of October includes a display of books on environmental issues. Meanwhile volunteers are distributing the cards and then going round to count how many have been displayed. The savings that have been achieved will be reported, once the results of counting the cards are known. Our stall attracted quite a bit of interest on Saturday and we sold savouries, cakes, books and plants. Our low energy dolls house was on display again and was in the sun this time, complete with solar energy, rainwater harvesting and vegetable garden, not to mention the bike for carbon-free travel. We are now focusing on preparing for the Launch of Greening Beeston at John Clifford School on 13th October - see more details under Events. 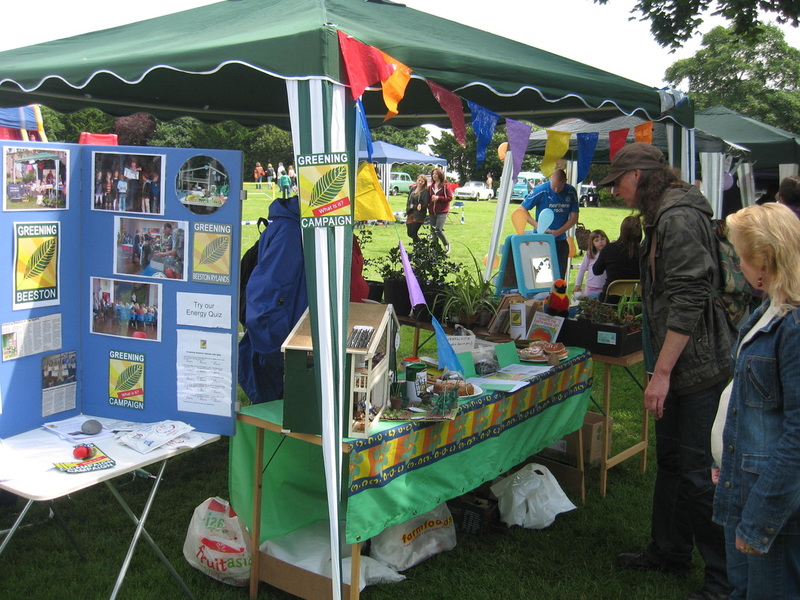 Greening Beeston will be having a stall at Beeston Carnival on 14th July. Come along and talk to us at the stall - find out about what we're doing and have a look at what we have to swap, sell or give away. More information in Events. Meanwhile we are planning the Launch of Greening Beeston, which will take place at John Clifford School on Saturday 13th October. More details will be available soon. Any help will be very welcome - go to Contact Us or come and see us at the stall. We have now been advised to withdraw the planning application for the wind turbine at Chilwell School, because of objections which make it unlikely to be approved. Meanwhile we are looking for other ways to achieve renewable energy in Beeston. Any help or ideas are very welcome - go to Contact Us. Greening Beeston’s 'green' Christmas Tree was displayed at Beeston Parish Church’s Christmas Tree Festival. The tree was constructed using branches cut from a tree growing in a local allotment, so that there was no carbon footprint associated with the growing, transporting or disposing of the tree. (The branches were composted afterwards.) To decorate the tree, the group used recycled items, such as sweet papers, chocolate wrappers, bottle tops, orange peel, berries and pine cones, making it look attractive without any cost involved, apart from the electricity for the lights, which was reduced to less than 1 watt by using LED lights. Read more about it here. 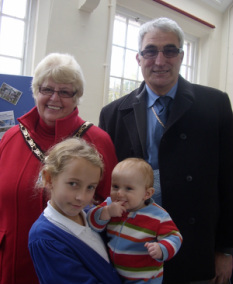 In October Greening Beeston held a great community event to launch the greening campaign in central and south Beeston. The event took place at John Clifford School and over 70 people came along to hear inspirational messages about how to save energy and water as well as saving money. The event also launched the Greening Beeston card which gave 9 easy steps to help the environment, such as taking shorter showers and not leaving TV’s on stand-by. Following this event, the card was distributed by volunteers in the local area. Over 3,000 households received the card and more than 60 households displayed the card to show they had chosen 5 of the actions to help the environment. Beeston South and Central residents are now saving about 29,000 kg of CO2 and 48,000 litres of water per year. However, if these figures are combined with the first Greening Campaign which took place in the Rylands, Beeston residents are saving roughly 75,000 kg of CO2 and 115,000 litres of water per year. That is enough to fill 75 hot air balloons with CO2 – a massive amount! There will be a meeting on Thursday 10th May at 7.30, Beeston Baptist Church to plan for the launch the Greening Beeston Campaign later in the year. We will be really glad of help with any of the activities. See Events for more information. 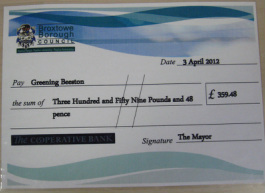 £359.48 from the Broxtowe Action Fund for new boards, table, etc. for future Greening Beeston displays. Some of the group attended a ceremony at Beeston Fire Station on 3rd April to receive the awards and meet other groups also receiving awards. 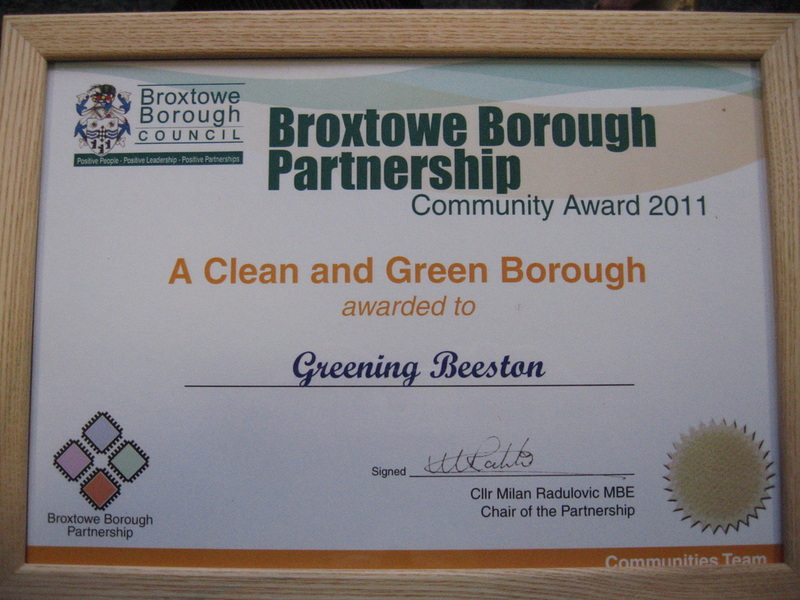 Recognition from Broxtowe Borough for what we are doing is greatly appreciated. The money is very welcome to help us improve our displays - watch out for us at Beeston Carnival. The planning application for the wind turbine at Chilwell School has now been submitted. Meanwhile we are looking for ways to raise the funds for the purchase and installation of the wind turbine. Any help or ideas will be very welcome - go to Contact Us. We had good weather for the Energy Event and people were interested to hear about saving energy and water, as well as information about recycling. The low energy dolls house (which we enjoyed fitting out) attracted some interest and we found some new people who are keen to help with our campaign later in the year. If you would like to help in any way, please let us know. The dolls house has one mistake (apart from being shaded from the sun). Did anyone notice what it is? Have a close look in the picture below. Come and find out about Greening Beeston at our stall in Beeston Square, 3rd March 10.00 - 3.00. Broxtowe Borough Council will be there with the 'Fantastic Home' exhibition trailer, with lots of information about energy and water issues for the home, resulting in significant £££ and CO2 savings, and has a variety of interactive tools, games, fact-sheets and energy saving giveaways that will save each visitor hundreds of pounds. There will also be an 'Energy Bike'. The meeting attracted a sizeable crowd of interested local residents. After presentations by Jerome Baddeley from Nottingham Energy Partnership and members of Greening Beeston, the audience contributed to at least an hour of interesting and stimulating questions. All were competently answered by Jerome or members of the group. Public Consultation - Saturday 29th October 2011 - Renewable Energy for Beeston? Saturday 29th October, 1.30 – 3.30, Beeston Library, Foster Avenue. ALL WELCOME! Refreshments available. Greening Beeston have secured a grant to pay for a detailed survey for an installation of a solar panels or a wind turbine for a public building in Beeston. Now you have a chance to help us choose where. If you can't attend on Saturday, please visit the display downstairs in the Library from Saturday 22nd October and have your say there instead. Click here to find out which are the possible sites. Solar electricity panels (also known as PV) use photovoltaic cells to capture the sun's energy and convert it into electricity. Because they don't need direct sunlight to work, they can still work on a cloudy day. However, they generate more electricity when the light is brighter, so the site chosen needs to take into account where the sun will be during the day. That means they need to face roughly south and be tilted up. 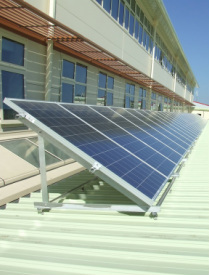 They are often installed on sloping roofs, where the panels can be attached close to the roof. A public meeting will be held at 7.30 on 27th September at Beeston Baptist Church (Dovecote Lane, NG9 1HR). We want local people and community groups to get involved with our campaign. Come along and you can help us choose the challenges to put on the back of our cards, which will then be distributed by volunteers. Speakers include Terena Plowright, who started the Greening Campaign, and Jerome Baddley of Nottingham Energy Partnership. For more details see here. The initial assessments of the chosen sites have now been completed by Nottingham Energy Partnership and many of them appear to be suitable for solar panels or a wind turbine, or both. Members of the group have contacted the owners of the sites and some were keen for us to proceed with the next stage of a more detailed survey. A public consultation meeting will be held on 29th October to give members of the public a chance to have a say in which site is chosen for the full survey. For information about the project, see the press release below. 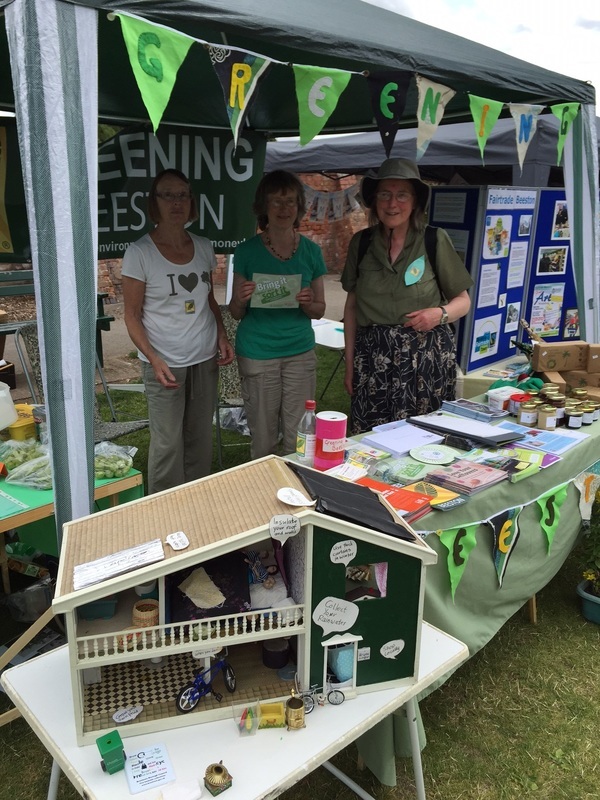 The Greening Beeston stall at Beeston Carnival on July 9th was a great success. We sold cakes, plants and bric-a-brac, as well as handing out information about our Greening group and other literature about saving energy. Our bunting of knickers and bloomers was to encourage people to wash at 30 degrees. For water saving we handed out bags to put in your toilet cistern. Sadly, we didn't have enough supporters on 30th June to receive additional funding for our Renewable Energy Project via the Energyshare website. But we are continuing with our renewable energy project and watching out for other opportunities. We are planning to have a public consultation meeting in October.